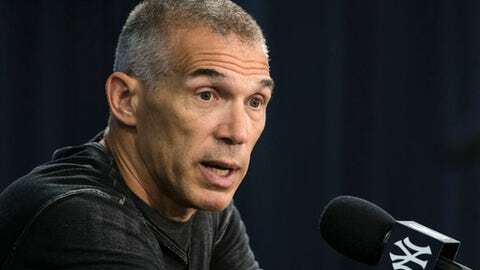 TAMPA, Fla. (AP) Starting his 10th season as New York Yankees manager, Joe Girardi wants to lead the team beyond 2017 and watch the Baby Bombers mature. Girardi is entering the final season of a $16 million, four-year contract. The Yankees won the 2009 World Series in his second season but have missed the postseason in three of the past four years, have not won a postseason game since the 2012 AL Division Series and pivoted toward youth last summer. Girardi doesn’t anticipate discussions about an extension with owner Hal Steinbrenner before the end of the season. Girardi managed the Florida Marlins to a 78-84 record in 2006 and is 819-693 with the Yankees. He is optimistic about New York’s young roster, which includes catcher Gary Sanchez, infielders Greg Bird and Tyler Austin and outfielder Aaron Judge. Girardi plans to start Masahiro Tanaka in the season opener April 2 at Tampa Bay. ”You’ve got to see where he’s at,” Girardi said. ”I don’t really see him not being our opening-day starter unless something was to arise I wasn’t expecting.” The Japanese right-hander went 14-4 with a 3.07 ERA in 31 starts last season. CC Sabathia is also entering the final year of his contract and wants to keep pitching after this season. ”If I’m healthy, I want to play as long as I can,” Sabathia said. The left-hander and Michael Pineda will join Tanaka in the rotation. RHP Luis Severino, bidding for a rotation spot, worked on mechanics with Pedro Martinez during the offseason in the Dominican Republic. … Workers were finishing the installation of new seats, padding on the outfield fence and completing the front entrance to the Steinbrenner Field in preparation for Wednesday’s first workout. A $40 million dollar project is renovating the ballpark and nearby minor league complex. … 1B-DH Chris Carter, who has a pending $3.5 million, one-year contract, has been assigned a locker and uniform No. 48.